Figure 13.1. Transit time. (Reproduced from A.S. Spirin & A.G. Ryazanov, in "Translation in Eukaryotes", H. Trachsel, ed., p.p. 325-350, CRC Press, Boca Raton, Florida, 1991). A: Schematic representation of the time-course of radioactivity accumulation in the fraction of growing nascent peptides (polyribosome fraction) and in the fraction of completed released proteins (supernatant fraction) after addition of radioactive amino acid. Note that after all the growing peptides are fully labeled the radioactivity in the polyribosome fraction becomes constant. 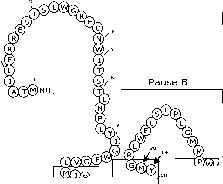 B: Theoretical kinetics curves of incorporation of radioactive amino acid into total polypeptides, completed released protein, and nascent polypeptides attached to ribosomes. T is transit time. (Modified from R.S. Wu & J.R. Warner, J. Cell Biol. 51, 643-652, 1971). In principle, the speed (rate) of any step of the elongation cycle (aminoacyl-tRNA binding, transpeptidation or translocation) may be regulated, but realistically aminoacyl-tRNA binding and translocation seem to be the most likely targets for control mechanisms. If the regulation affects a given step of all cycles more or less uniformly the cycle frequency will be altered and, hence, the general elongation rate will change. On the other hand, one or another step of specific elongation cycles along mRNA can be intervened; e.g., aminoacyl-tRNA binding to a specific codon can be slowed down, or translocation through a specific site of mRNA can be impeded. 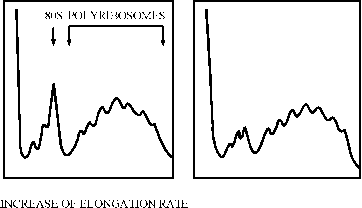 In this case the elongation becomes uneven (discontinuous), and translational pauses may arise, resulting in a change in average elongation rate. Regulation of the cycle frequency and the translational pausing seem to be two main phenomena in the control of elongation rate. Figure 13.2. 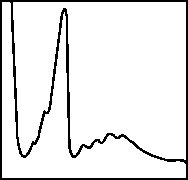 Diagrams of mono- and polyribosome distribution profiles upon sucrose gradient centrifugation. (Reproduced from A.S. Spirin & A.G. Ryazanov, in "Translation in Eukaryotes", H. Trachsel, ed., p.p. 325-350, CRC Press, Boca Raton, Florida, 1991). translation. Often it is sufficient to know just relative changes of elongation rates. This can be done by recording a change in the profile of polyribosome distribution upon sucrose gradient centrifugation (Fig. 13.2). The polyribosome profile depends on the rates of initiation, elongation and termination. Generally, slowing down the movement of ribosomes along mRNA at a constant initiation rate will result in an increase of heavy polyribosome fraction (i.e., increase of the density of ribosomes on mRNA). It is obvious, however, that the increase of initiation rate at a constant elongation rate will give the same result. Hence, the analysis of polyribosome profiles by itself is not always sufficient to judge about changes in elongation rate, and the information about the rate of total translation (the rate of amino acid incorporation) is required. Three clear cases can be considered. (1) The "light shift" in polyribosome profile (decrease of the number of ribosomes per mRNA) indicates the elongation rate rise, if the amino acid incorporation (translation rate) increases or does not change. (2) The "heavy shift" in polyribosomes implies the elongation rate drop, if the amino acid incorporation goes down or does not change. (3) The absence of shifts in polyribosome profile with simultaneous increase or decrease of the amino acid incorporation will give evidence that the elongation rate increases or decreases, respectively. As already mentioned, the cycle frequency cited above (Section 13.1.2) can be considered only as an average value for the entire elongation on a given mRNA. There is experimental evidence that the elongation rate may be not constant during translation of an mRNA chain. In other words, the ribosome can move with different speed at different sites within mRNA. First of all, it was reported that during synthesis of the globin chains in rabbit reticulocytes the size distribution of nascent peptides was not continuous but rather displayed discrete size classes, thus suggesting some discontinuities in the process of translation (during elongation) (Protzel & Morris, 1974). Similar results were obtained with the synthesis of bacteriophage MS2 coat protein in MS2 phage-infected Escherichia coli cells (Chaney & Morris, 1979). 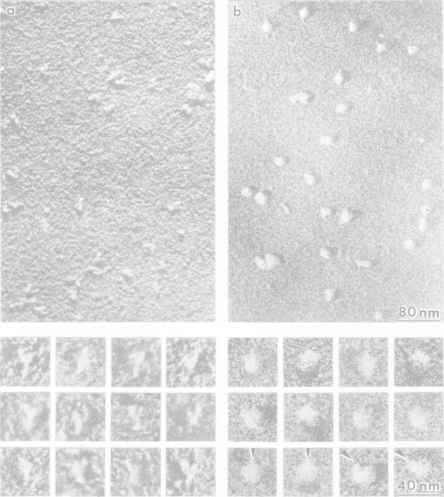 Discontinuous translation was also observed in intact cells and in cell-free systems for a number of other proteins, e.g., silk fibroin (Lizardi et al., 1979), vitellogenin and serum albumin, preprolactin, preproinsulin, procollagen, encephalomyocarditis virus proteins, the large subunit of chloroplast ribulose-1,5 biphosphate carboxylase, chloroplast reaction center protein D1, tobacco mosaic virus proteins, bacterial colicins, etc. (reviewed by Candelas et al., 1987). All these observations have led to the conclusion that the ribosomes move along the mRNA chain during elongation with a non-uniform rate: from time to time, at a few specific sites of mRNA, they can slow down their advance or stop temporarily. In other words, more or less long pauses may occur during elongation, at least in some cases. Pauses at specific sites during polypeptide elongation may play an important role in cotranslational folding of proteins, cotranslational assembly of larger protein or protein-membrane complexes, and cotranslational transmembrane transport (Kim et al., 1991; Krasheninnikov et al., 1991; Komar & Jaenicke, 1995; Young & Andrews, 1996). In the process of cotranslational protein folding, especially in the cases of multi-domain proteins, the correct folding of an N-proximal part or domain on the ribosome may require some time in the absence of interactions with a following section of a nascent polypeptide. The pause after the completion of a structurally autonomous or semi-autonomous portion of a nascent polypeptide would provide the delay in producing a next portion of unfolded chain and thus the time necessary for undisturbed self-folding of the completed portion on the ribosome. Pausing at interdomain borders during synthesis of multi-domain proteins have been discussed repeatedly. Pausing during elongation of chloroplast reaction center protein D1 is an excellent illustration of the correlation between the pause sites, on one hand, and the stages of cotranslational binding of cofactors such as chlorophyll to D1 and the cotranslational integration of D1 into thylakoid membranes, on the other (Fig. 13.3). Another role of translational pauses at specific sites may consist in providing the targets for regulation of protein synthesis at the level of elongation. First of all, pausing can be regulatable and therefore an overall production of a protein can be modulated by increasing or decreasing the duration of a pause (see below, Section 13.3). Second, pausing during elongation can stimulate frameshifting at the pause site (Spanjaard & van Duin, 1988), similarly to the frameshifting provoked by termination codons (see Section 12.4.2). Three different mechanisms which may underlie the translational discontinuities (pauses) are discussed below.